Issue #213 • November 19, 2015•Sold Out! Henry Heinrich woke to a pounding at the cottage’s front door while the rain tattooed shingles, windows, and pocked green siding. He swam up from the dark, pushed off the couch, found his feet, worked the deadbolt with stiff fingers, turned the knob, and saw Jim Kursk with a tall, red thermos in his hand. “You are needed,” Kursk said. Heinrich had fallen asleep drunk and in his clothes. He put on rubber boots, a green John Deere cap, and a yellow raincoat. He sat down at the table, coughed, and asked for water. Kursk brought him a full mason jar, cold from October pipes. He gulped the quart and set the jar down empty. Kursk poured coffee into the thermos’s red cap and pushed it across the table. Heinrich took the Leatherman from his belt and trimmed a stray finger of black rubber from his boot’s tread. Kursk drove them over the river and through the north end of St. Catherine. The boy’s name was Lance, and he was sixteen. In Kursk’s pocket was a document to be signed by the parents, stating that they would never disclose the events of the day. They stepped from the Ford truck. Heinrich walked beneath an oak, crunching acorns under his boots. The father met him on the porch, took his elbow, shook his hand, and nearly pulled the hundred and eighty-eight pounds of him through the door. He did not see the mother. “Please do this thing right,” the father said. J.F. Glubka received an MFA from the Iowa Writers’ Workshop, where he was a Teaching-Writing Fellow. His short stories have been published in Southwest Review and Alaska Quarterly Review. He has written an unpublished collection of short stories and is working on a nonfiction book and a novel. He lives in Eugene, Oregon, where it never rains. What would you do if you learned you had the power to cheat death, to bring a corpse back to life with nothing but the touch of your hand? This is the question faced by Henry Heinrich, the protagonist of J.F. 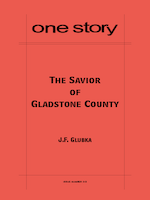 Glubka’s “The Savior of Gladstone County” (issue #213). WA: The protagonist of “The Savior of Gladstone County,” Henry Heinrich, possesses the ability to bring people and animals back from the dead. Can you talk about the role of the supernatural in your work? JG: Doing magic is tough. As a boy I was interested in dragons, vampires, giant squid, man-eating sharks, anthropomorphic badgers, sword-wielding turtles, extraterrestrials, and dinosaurs. Boundaries were blurry. As a young man in my early twenties, I was drawn to Denis Johnson’s junkies, Chuck Palahniuk’s outsiders, and Hemingway’s war-weary machismo. Realism, with a few exceptions, became my preferred mode in my late twenties and has remained so to this day. I’m happy to work with a supernatural concept, as with tools from any genre, provided the story I’m writing hooks me and I feel that I can tell it in a fresh, vital, and honest way. Realism seems much easier to manage for the writer of literary fiction. The more the story slips into impossible worlds, the greater the bridge the writer must build to cover the gap of believability. JG: There seems to be some narrative DNA that belongs to the standard myth of Jesus Christ and to various Marvel Comics’ superheroes. I’d also credit the atmosphere of the American Midwest, where I have family and spent two blizzard-and-mosquito years figuring out how to be a writer. WA: Henry is a guy who takes his special ability in stride. He doesn’t use it to get rich or famous, and he doesn’t dwell on its origin or meaning. Did you know from the start that this is who Henry would be, or did you explore other possibilities? JG: When I wrote the first draft, I was renting a room in a little house in Portland, Oregon, and working nights as a security guard. The most famous people I met in Portland were the local TV news anchors, who worked in a downtown studio. It was my duty to unlock a door for them as they arrived at work about five in the morning. One of them was a weatherman. Since I didn’t watch TV at home, his minor fame was totally lost on me. I kept Henry secluded, unambitious, and relatively poor out of instinct and a preference for handling smaller lives. A modern person is practically haunted by all the big, beautiful, sainted lives that inhabit his media devices. I always saw Henry as being a small soul stuck in a small place among small dramas. WA: Are there particular authors or works that informed your approach to this story? JG: My preferences in fiction tend to be realist stories. As to style, I think there have been too many influences to count. As to content, Kevin Brockmeier’s The Illumination probably had some subconscious impact. A tonnage of bad movies and TV—mostly Stephen King adaptations and their infinite imitators—provided much of the creative topsoil. WA: One of the first things that struck me about this story is the terse, matter-of-fact writing style. Would you say the style is typical for you, or was there something about the characters and/or subject matter that called for such a style? JG: My half-conscious premise was that ornate language and long sentences would imperil the story’s basic trick, which is to make something akin to a faery tale unfold in the mode of straight realism. Generally there’s an attraction for me, as reader and writer, to telling a story as viscerally and directly as possible. I want to write sentences that jab the reader in the central nervous system. JG: The first draft was written in a few weeks almost precisely two years prior to the last draft being completed, with lots of layover in between. JG: I have a collection of short stories, which is finished and awaiting its own publishing savior, and I’m working on a nonfiction book and a novel.